Philadelphia 76ers center Joel Embiid reacts after a call in action against the Oklahoma City Thunder during the second quarter at Chesapeake Energy Arena. It's unlikely these two teams will ever meet in a playoff series, but it feels like a shame that the Sixers only play the Oklahoma City Thunder twice a year. Their national TV game on Sunday was one of the more heated midseason matchups in recent memory, featuring a variety of nasty dunks, stare-downs and general hoopla en route to a 122-112 Thunder win. The Sixers ended up on the wrong side of this one yet again, and they won't leave happy knowing they had to listen to Russell Westbrook talk trash while walking off the floor. Still, a good learning experience for a young team trying to find its way. We haven't seen him pull off many poster dunks in his career so far — the guy tends to mistime his jumps on lobs, for some odd reason — but Embiid absolutely uncorked on on Westbrook in the first half on Sunday night. Complete with a staredown after the play, this one felt a little personal. Embiid and Westbrook traded barbs after their first meeting in December, and they picked up right where they left off. This sort of "rivalry" is part of why I love the NBA in the first place. They aren't ever truly guarding each other or really competing for the same things, but two loud, brash personalities have stumbled into an intense dislike for one another despite rarely playing against each other. It's random, it's silly but it is Grade A entertainment. It also helps that both of these guys are among the best in the world at what they do. Embiid had it absolutely going on from midrange against the Thunder, and he took the best defense Steven Adams had to offer and tossed it in the recycle bin. Westbrook had a tougher time getting it going against Philadelphia's defense, but he won the war of attrition in the end. As much as I loved Allen Iverson watching him as a kid, watching Westbrook reminds me that a lot of people (locally or otherwise) would probably be driven nuts if his prime took place in this era. The highs are breathtakingly high, but when he hits halftime shooting 6/20 having tossed up a ton of ridiculous bricks, you're left scratching your head. What you're also reminded of is how different it is to have a guard who can take over the game on offense. Because Westbrook is bringing the ball up and running the sets for Oklahoma City, he inherently has more control than a guy like Embiid does on offense. Embiid can certainly do things he can't — you know, that whole rim-protection thing — but he can't dart through lanes, push by himself in transition, or otherwise seize the game in the way a guy like Westbrook does. 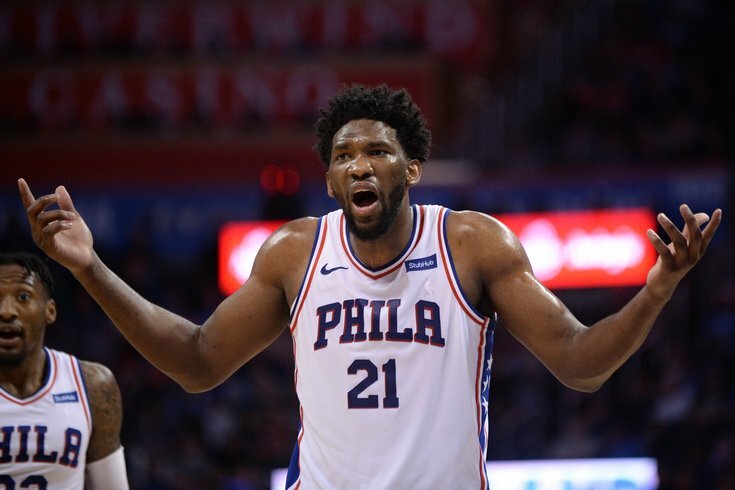 That's life as a big man in the NBA, and when Embiid goes for stretches without shooting as he did Sunday night, it's easy for the game to start slipping out of Philadelphia's hands. He made his best effort at "quarterbacking the gym" as Brown likes to say, but his guys didn't always redeem his good passing with made shots. He didn't have his best defensive game against Oklahoma City, as he ended up getting sucked out a little too far on a few Westbrook-Adams pick-and-rolls that ended in dunks for the opposing center. Still, a very good game from the young center in a loss. And he certainly won the social media battle after the game. This game highlighted just how important Saric has been to the Sixers' success. I suppose it exposes the limitations of the guys behind him, too. As we discussed following the game against San Antonio, Trevor Booker hasn't really found a spot in the Sixers' rotation that works for him. He makes plenty of plays individually through his sheer work rate, but the Sixers continue to go backward in the minutes he's on the floor. There are problems in any lineup configuration you play him in; he either crowds Embiid in lineups where they share the court, or he compounds the spacing issues in lineups where he plays with Amir Johnson and Simmons. His coach didn't exactly help him out on Sunday evening. Booker played in a lot of lineups that only served to amplify his issues; when you play him with Simmons, TJ McConnell and Justin Anderson simultaneously, you're just asking for trouble. There aren't a lot of good options here when Saric has to sit for long stretches of time, especially when you're down JJ Redick in the guard/wing rotation. Sliding Covington up to the four is the ideal move when you're buying Simmons rest, but there are ramifications elsewhere in the lineup if you go that way. Richaun Holmes played some decent minutes to start the fourth, and he has looked pretty damn good in a small timeframe next to Embiid, so maybe that's the answer. But Brown seems to have a clear preference for Booker at this juncture, so that seems unlikely to be a Sixers staple. But Booker's instinct is to mix it up inside. This creates problems for a team with a lot of guys who want to do the same thing, and even when he does hang on the perimeter opposing defenses don't respect him, so they sag toward the paint and get a head start anyway. This is not really his "fault" but it doesn't appear as though he can just shut off his instincts with more time playing with the rest of the group. The Sixers badly need another four who can stretch the floor a bit, and to find some way to incorporate Booker that doesn't junk things up for guys like Embiid and Simmons. It's still hard getting used to Simmons being capable of defending Westbrook and Paul George in the same game. He has been a much bigger part of Philadelphia's elite defense than he's probably given credit for, and he has a much larger stake on that side of the ball than he has any business possessing at this stage of his career. For a guy his size, Simmons has incredibly active hands on the defensive end. Because he has the athleticism to recover back to the three-point line when he cheats off his man, he's able to help out when players get deep into the paint. Once he gets his hands on the ball, it's a track meet the other way. Simmons' +/- didn't end up looking pretty, but I don't think that was a reflection of how he played against the Thunder. He leaned more toward being assertive on the offensive end, with a 10/14 shooting performance that included a few jumpers. The results were a mixed bag, but the fact that he's taking them more regularly is a good sign in and of itself. Perhaps most importantly, he did that without hurting the Sixers in the turnover battle. He gave the ball away just once on Sunday night, and when Simmons takes care of the basketball it's clear the Sixers can compete with most anyone in the league. He's slowly starting to put things together, and he has had an excellent month of January after a rough stretch in December. McConnell went 4/4 from the field against the Thunder, and I am generally a fan of guys who know what shots are "their shots." But at some point McConnell is going to have to take all the work he has put in to improve as a shooter and translate it into a willingness to shoot when he's in an NBA game. Take this play, for example. McConnell ends up dipping in and scoring on a mid-range jumper, and you see that result and think, "Great!" But the play is representative of his broader tendency to pass up open looks from beyond the arc, and he simply can't continue to do that. The Sixers can only have so many guys on the roster who are hesitant to take threes, or who don't take them at all. Eventually, you run into a bit of a math problem with the way basketball is played these days. You can't have a team built in part around a 6'10" guard/forward who doesn't shoot threes, and then have one of your key bench players who spells him avoid taking them regularly. You can cut this two ways: an optimist would say McConnell shooting 45 percent from three this season because he's only taking shots he's totally comfortable putting up, and a pessimist would counter that the number is inflated and he's not adding as much value as they need from him as a shooter. Both these ideas can be true, though I suppose I might lean toward the latter camp. It was not McConnell's night on Sunday, as the Westbrook matchup is not one best suited for his success. That's all well and good because he has done more than prove his worth to the team this season. However, if he has space in the corner, he has to be letting it fly. He is working on it, has shown improvement, and has to be willing to live with the results. Timothe Luwawu-Cabarrot is still a little unprepared for "the moment"
The fourth quarter of the Thunder game was the first time you really felt the absence of JJ Redick shine through. Luwawu-Cabarrot has done an excellent job in his absence, it's just hard to replace Redick's demeanor and shooting ability in crunch-time. When you don't have a deep base of crunch-time reps to work from, it's easy to talk yourself out of shots or overthink plays you were comfortable making early in the game. When TLC caught a pass in the corner with just over a minute left, he never even thought about shooting before kicking the ball over to Robert Covington. Unlike McConnell, whose hesitance to shoot threes doesn't show up in the rest of his game, TLC's passiveness here crept into the rest of what he had to offer in crunch time. There was far too much letting the moment dictate him, when he should have been trying to dictate the outcome himself. This was a good opportunity for him to get reps in a meaningful moment, and he didn't do much with them. That's okay, and the coaching staff will likely take a look at something like this with him and reinforce that they want him taking a corner three when he gets one. In this program, they are happy to live with missed shots as long as you're taking the right ones. You miss 100 percent of the shots you don't take, etc. etc.